Can Google Search Solve the Most Topical Issue in Fashion Right Now? There’s one thing that most of us have in common: We all Google. So when the tech giant decides to break into the Fashion Industry, it seems to be providing an alluring set of qualities that deserve our attention. This season, several fashion brands are determined to switch from a traditional model into a see-now-buy-now system. Basically, it means that they are aiming to sell looks straight off the runway shows and are also pairing seasons to match the actual weather. This works against the previous fashion calendar, where Fall collections would be presented in Spring and vice versa. After the runways, clothes would be available in stores – but several months later. Considering that this real-time shopping experience hasn’t been attempted at this scale before, it will certainly involve a long trial-and-error-phase for brands who have already been taking different approaches around it. American designer Rebecca Minkoff for example, opted for employing a retail app, whilst others chose to experiment with pop-up shops and even with chatbots via Facebook. As this develops, massive changes seem to be ahead in the fashion industry. So can Google save the day? Two new experimental research features have been announced, ‘Fashion Week Search‘ and ‘Shop the Look‘. For the first one, more than 50 brands including luxury giants like Hermès, Tom Ford and Burberry, became part of the initiative that allows companies to personalize their own search. For example, after typing the name of American brand Proenza Schouler, a carrousel with their logo will appear in the first page and several posts will showcase runway photos, videos, and links to shop the Fall 2016 Accessories collection on real-time directly from the brand’s official website. 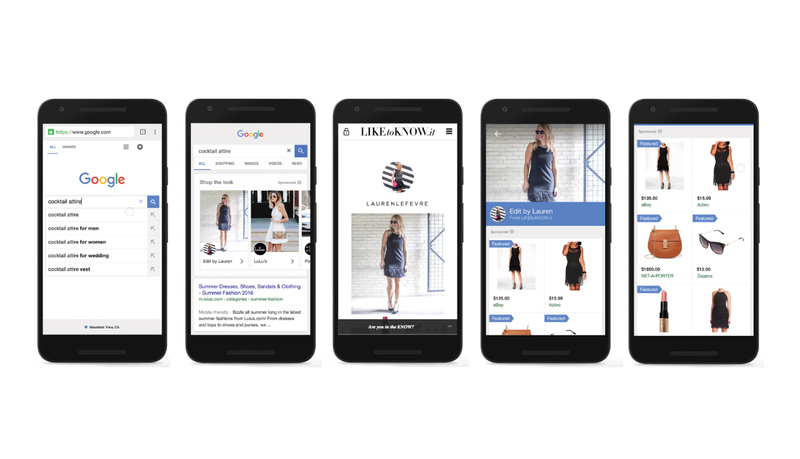 For the release of the second search tool, ‘Shop the Look’, Google partnered with LIKEtoKNOW.it, a shopping system for Instagram that works through links that are sent to your e-mail after you like a post of an affiliated blogger. In this case, the Search Engine is habilitating options to shop for Street Style Looks during Fashion Week. Although the first tool mentioned will only be available until the end of the shows, this one will remain on trial period a little longer. Which means that from now on, if you search for a wedding or cocktail outfit, inspirational ideas from bloggers will appear at the top of your search, linked to the suitable retail links to purchase that look. In this new Fashion Week venture, Google has employed the knowledge of Editor Kate Lanphear – previously at Elle and Maxim – and is collaborating with photography agencies such as firstVIEW and BFA. As they say, “get a front row seat to Fashion Week with Google Search.” For all fashion lovers out there, sounds pretty good right? Since personalization is usually based on consumer’s previous attitudes and behaviour, this seems to be adding to the so-called ‘Filter Bubble’, which can certainly have a negative impact in people’s lives by limiting our range of choices (Pariser). Appearing in the ‘Fashion Week Search’ page doesn’t have any cost, although through ‘Shop the Look’, retailers will be charged with a standard advertiser click-rate. But at the end of the day, could this set of tools compete with social media? Not only could this possibly shift traffic from Instagram, but also from several other websites. One of the carrousels offers links to real-time news from different sources, but it’s also possible to look at the runway pictures directly from the results without leaving the page. For me at least, this task was easier than browsing through Vogue Runway or [insert any other preferred site]. On the downside, the search tool seems to have regional blocks, with some features exclusively available for US (only during the trial period), but others appear visible for UK too. It will be interesting to see how the engagement was once Fashion Week is over and if it helped brands achieve their real-time sales. So far, it seems that this attempt for a fashion-friendly Google Search, is trying hard to achieve what other platforms have been looking out to do for several years. Search and shop in a click. Could this really be the solution that the Fashion Industry has been looking for? Arthur, Rachel. 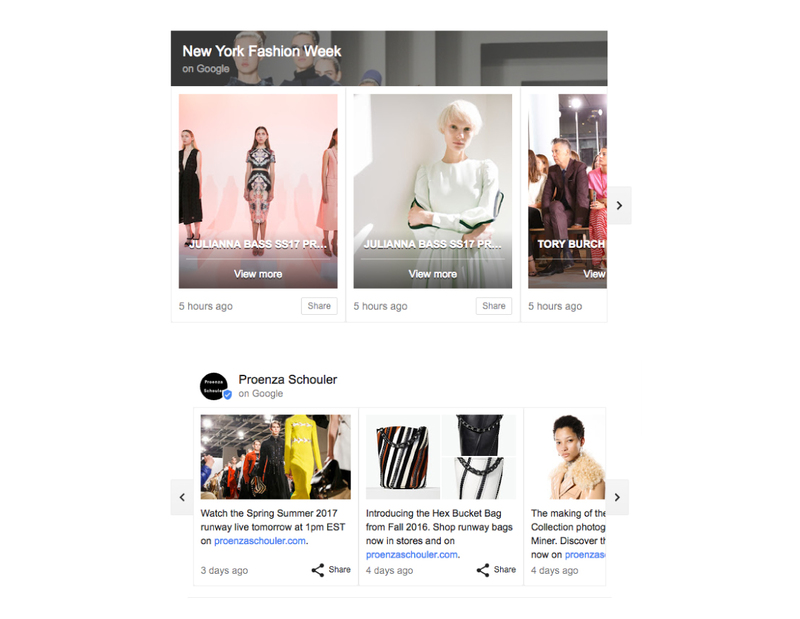 “Google Is Making Street Style Fashions Shoppable In New LiketoKnow.It Partnership.” Forbes. N.p., n.d. Web. 13 Sept. 2016. 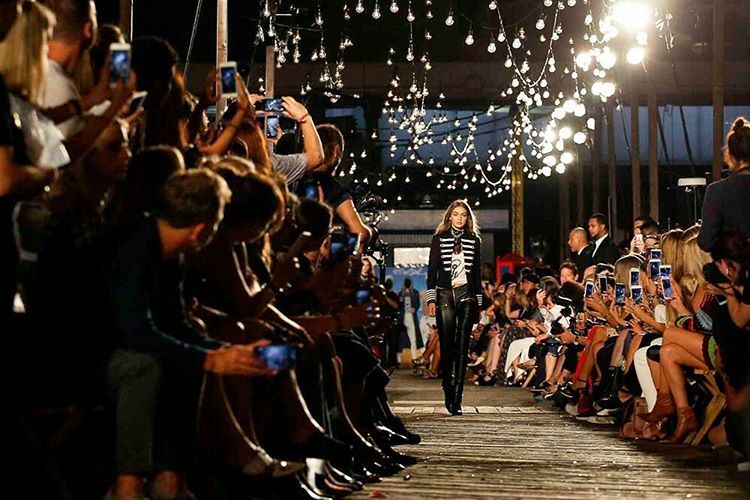 “Get a Front Row Seat to Fashion Week with Google Search.” Inside Search. N.p., n.d. Web. 13 Sept. 2016. Harnisch, Michael J. “Impacts of the Developments in Digital Media and Communication Technology on Personalization Research.” Collnet Journal of Scientometrics and Information Management 8.2 (2014): 353–370. Taylor and Francis+NEJM. Web. “How Designers Are Getting You to Shop Fashion Week | Glossy.” N.p., n.d. Web. 13 Sept. 2016. Pariser, Eli. The Filter Bubble: How the New Personalized Web Is Changing What We Read and How We Think. Penguin, 2011. Print. Schroeder, Ralph. “Does Google Shape What We Know?” Prometheus 32.2 (2014): 145–160. Taylor and Francis+NEJM. Web. Shaker, Lee. “In Google We Trust: Information Integrity in the Digital Age.” First Monday 11.4 (2006): n. pag. firstmonday.org. Web. 13 Sept. 2016. “Shop the Look on Google.” Inside AdWords. N.p., n.d. Web. 14 Sept. 2016. Statt, Nick. “Google Wants You to Buy Clothes Straight from Search Results.” The Verge. N.p., 6 Sept. 2016. Web. 14 Sept. 2016. Tepper, Fitz. “Google Is Launching Shop the Look to Let You Search and Shop by Outfit.” TechCrunch. N.p., n.d. Web. 14 Sept. 2016. Wakabayashi, Daisuke. “This Fashion Week, Google Gets a New Look.” The New York Times 1 Sept. 2016. NYTimes.com. Web. 12 Sept. 2016. « Gboard: The Ultimate iPhone Keyboard? Question time: which of your problems should Google solve?